The global sales of electronic cigarettes (“e-cigarettes”) surged exponentially in a few years by 170-fold to a total of US$3.5 billion in 2015 while its prevalence among youngsters also increased significantly in the U.S. and European countries. In Hong Kong, a wide variety of e-cigarettes are easily accessible and the potential health risk should not be underrated. COSH has serious concern on the spread of e-cigarettes and in March 2015, advocated a total ban on e-cigarettes. 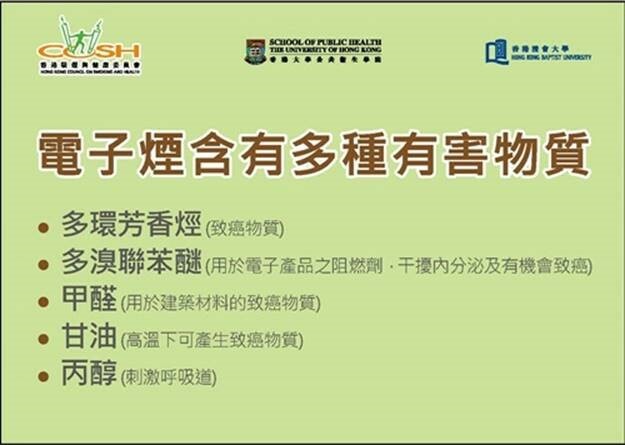 The School of Public Health of The University of Hong Kong was commissioned by COSH to conduct the Tobacco Control Policy-related Survey 2015 to monitor prevalence of e-cigarette use and measure public opinion on its ban in Hong Kong. Public Opinion Programme of The University of Hong Kong was commissioned to interview over 5,000 respondents, including 1,834 never smokers, 1,712 ex-smokers and 1,706 current smokers, from April to October 2015. The survey found that 85.4% of respondents had heard of e-cigarettes compared to 75.4% in 2014. Around 0.9% of respondents had ever used e-cigarettes. It was also found that the main reason for e-cigarette use was not to aid smoking cessation and 68% of users did not know what they inhaled. Although only 0.2% of respondents had used e-cigarettes in the past 30 days, the rate (7.9%) among young current smokers aged 15 to 29 years was significantly higher than that of current smokers aged 30 years or above. Besides, majority of respondents supported various regulatory measures on e-cigarettes including restrict sale to minors (93.7%), ban the use at smoke-free areas (81.4%), restrict sale of non-nicotine e-cigarettes (81.2%), regulate e-cigarettes as cigarettes (79.4%) and ban e-cigarettes publicity and ads (70.8%). Over half of the respondents (53.5%) supported all of these regulatory measures. A wide variety of e-cigarettes are now available in Hong Kong via various sale channels and are mainly targeting the youngsters. However, most of them do not provide details on their components nor carry any health warnings. Some e-cigarettes are even marketed as “healthy”, “non-carcinogenic”, “non-toxic”, “safe” or ”no harm” which mislead consumers. Users inhale unknown substances will bring potential health risks. The safety and effectiveness of e-cigarettes as a smoking cessation aid are unknown. Insufficient evidence has been identified so far to support the claim that e-cigarettes help smokers kick the habit, says the World Health Organization (WHO). At least 16 countries have imposed a total ban on e-cigarettes, including Singapore, Thailand and Brazil, which is a global trend. COSH urges the Government to enact a total ban on the sales, advertising, promotion and sponsorship, distribution, import and manufacturing of e-cigarettes in Hong Kong promptly. 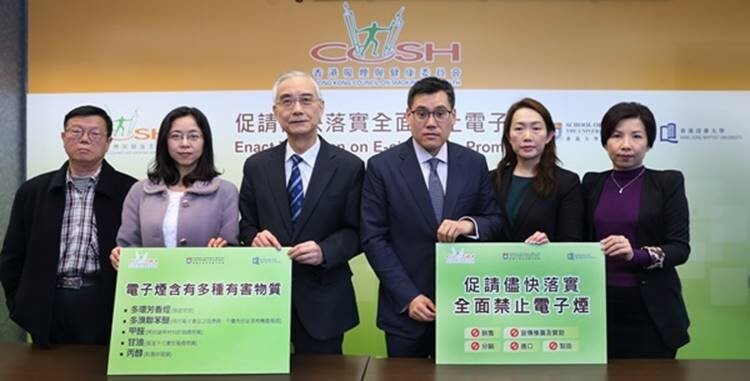 In the meantime, COSH will spare no effort in publicity and education to prevent its epidemic and stop it from becoming the gateway to youth smoking in Hong Kong. COSH urges the Government to enact total ban on e-cigarettes promptly to prevent its epidemic and stop it from becoming the gateway to youth smoking in Hong Kong. Carcinogens and other harmful substances which can bring potential health risks were found in e-cigarettes in the laboratory test. Posted in: Health Risks, Hong Kong, Study, Vaping Ban.